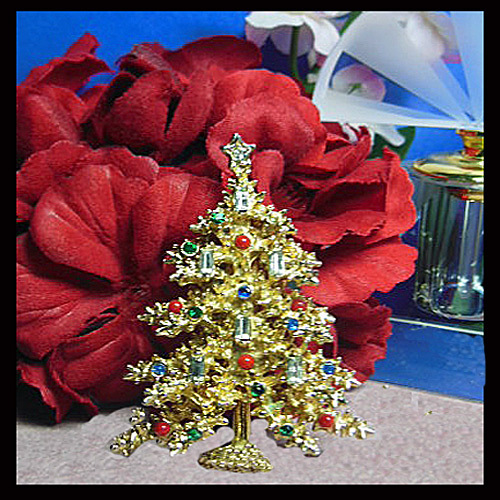 This is a beautiful, vintage, three dimensional Christmas tree brooch, signed ART, featuring emerald green and sapphire blue rhinestones with small red beads on a lovely gold tone setting. Graceful candles designed with long clear baguettes add to the beauty of this stunning tree. The base has a raised braided design and a star with one tiny clear rhinestone sits at the top. It measures 2 1/4" in length, 1 1/2" wide and 1/2" deep. It comes to you in excellent condition ready to usher in the Holiday Season. It will also make a great gift item for someone special.